Leafing through the latest issue of Travel + Leisure magazine, I was excited to read their list of "50 Best New U.S. Restaurants." Of course the list was annoyingly heavy on New York City restaurants - always the case with East Coast-centric magazines. But San Francisco garnered prominent coverage with eight freshman eateries, and I was delighted to see La Mar Cebicheria Peruana among them. This may be the first time a non-Japanese-cuisine eatery has rated posting in RawFishionado! But it's almost shameful that I haven't posted it earlier, since La Mar is all about high-grade raw fish, served up deliciously. I had the pleasure of trying La Mar when I was in San Francisco during New Year's. It's a beautiful restaurant on The Embarcadero, next door to that foodie paradise, the Ferry Building. 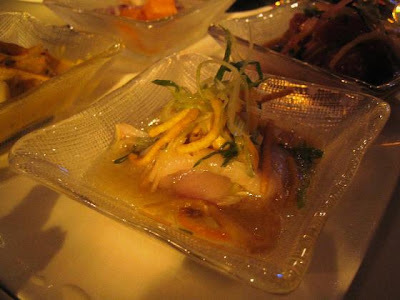 As the full name implies, the restaurant specializes in Peruvian cebiche (ceviche), the Latin-American method of "cooking" seafood with a citrus bath. I had never tried the Peruvian version until I ate at La Mar. 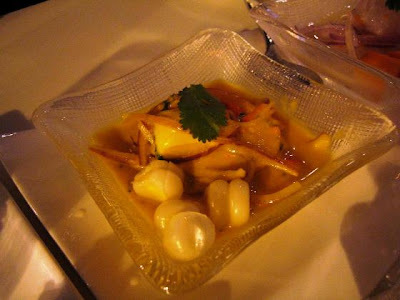 Peruvian cebiche is typically prepared with shark and other white fish bathed in lime juice, peppers and onions, and served with chunks of cooked potato or yam and corn. The lime-and-peppers marinade is also typically served up in shot glasses - and called "leche de tigre" (tiger's milk) - at cebicherias. Of course, I also love Mexican ceviche, which is often prepared with a mix of seafood, especially shrimp and octopus, and can include tomatoes and avocados as garnishes. 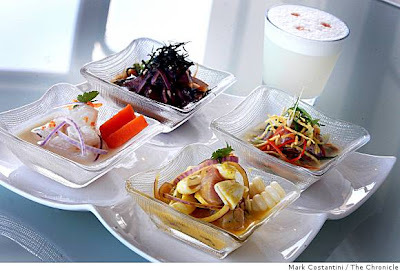 While La Mar focuses on Peruvian style, the menu reflects variations that give an admiring nod to other cultures, from Asian to Central American. A tasting of five "leche de tigre" shots is also offered. My girlfriends and I got a nice table in the bar area, next to a big window looking out at the city. We ordered several of the different types of cebiche so we could conduct our own taste tests and see which we liked best. Cebiche Mixto: Mahi mahi, calamari, octopus, habanero pepper in aji amarillo with cilantro, red onion, Peruvian corn (the big white kernels that look like pearls in the pic) and yam. Fresh tasting, with a nice hot KICK. Didn't even taste the cilantro! 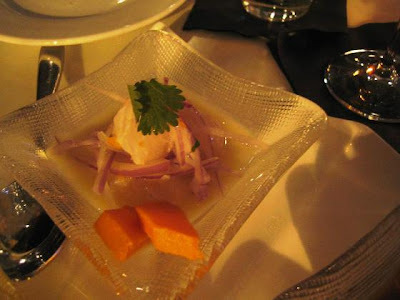 Cebiche Clasico: Halibut and red onion in a habanero leche de tigre with Peruvian corn and yam. Melt-in-your-mouth goodness and surprisingly mild despite the habanero and lime bath. 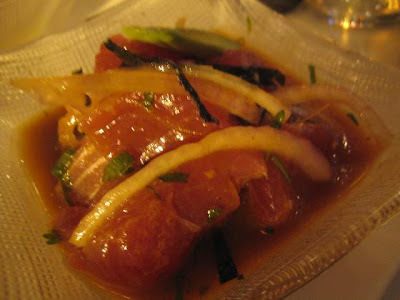 Cebiche Nikei: Ahi tuna, avocado, cucumber, red onion in tamarind leche de tigre bath. Very Japanese in flavor - yum. Cebiche Chifa: Yellowtail with peanuts, scallions, ginger, pickled carrots, daikon, wonton strips and habanero pepper in a cilantro-sesame leche de tigre. Yummy Thai-South Asian sesame flavor. No, this isn't dessert. 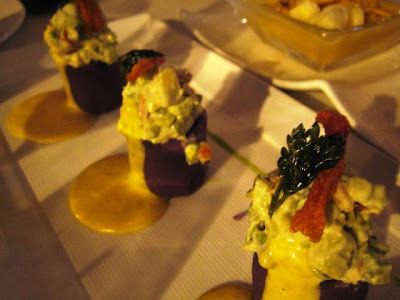 It's Causa Cacera: mashed purple potato forming the base, topped with artichokes, asparagus, avocado and tomato confit with basil-cilantro oil. Loved the flavors, which mingled perfectly in a balanced, comforting way, with no one taste dominating the dish. Sitting in the airy, lovely restaurant with good friends, nibbling on these refreshing tastes and sipping on a glass of Latin American wine or a cocktail made with Peruvian Pisco (a liquor made with grapes), is a little slice of heaven, indeed. Will sashimi soon be extinct?